Setting out on a voyage with any new yacht is always an interesting experience. 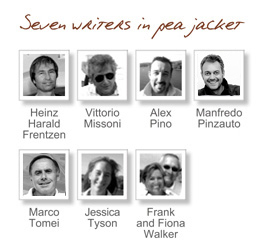 There is so much to learn about the systems and the way the yacht performs. Past experience with other yachts can shorten the learning process a great deal but with Magellano we were having to learn how this new hull design would perform. I had every confidence in Bill Dixon as a designer, he has so much experience but I wanted to look at Magellano from a seaman’s point of view. Designed as a long range cruising yacht it was very important to understand how Magellano would perform in adverse conditions as well as in fine conditions. On the run up from Viareggio to Varezze we had a wide variety of conditions ranging from Calm to lively seas. This is normal Mediterranean weather in the winter. In The calm and slight sea conditions we could wind up Magellano to its top speed of around 24 knots and she behaved well and predictably. The acceleration is quite surprising for what looks like a displacement design. It accelerates like a sports boat and it turns smoothly and easily so it really is a fun boat to drive. This was a good time to check out the impact of the interceptors on the performance. The interceptors are used to adjust the fore and aft trim and by experimenting we found that we could get an increase in speed of around 1 knot at intermediate speeds when the interceptors were half down. This could be significant on a long cruise because it show the yacht is running more efficiently. There did not appear to be much effect by varying the interceptor settings at low and high speeds but it would pay to fine tune the trim whenever setting out on a long run to find the optimum setting. In the lively seas when we encountered the winds flowing down the valleys around Genoa the yacht handling the conditions very well at time the wind was force 5, generating quite a rough sea with a lot of white crests. The yacht handled this well although there was a lot of spray. We were running at 16 knots and with the stabilisers on the yacht remained upright and steady and it was possible to walk about without holding on most of the time. It was impressive performance from 74 footer. With the wind on the bow the spray was sweeping over the windscreen but the wipers coped well. To see the difference we switched off the stabilisers and there was a noticeable reduction in the spray suggesting that the hull was moving and absorbing more of the shock of wave impact. Of course the movement of the yacht was more lively but it was still comfortable and the difference between the movement with the stabilisers on and off was not as much as I would have thought. So we built up a lot of confidence with that first run and the time spent in Varazze doing demonstration runs showed just how well the yacht handled in tight spaces in marinas. Using the joystick control it was possible to park Magellano within inches of where you wanted it to be. As always it took some time to build up confidence in the system but it is great to have this level of control when you are entering a strange marina on a cruise. Leaving Varezze was our first chance at a long run in Magellano, the first serious test for the yacht. It was late morning when we left, heading down the coast to San Remo for refuelling. It was an exciting voyage along this scenic coastline with the wind coming down off the mountains creating very changeable wind conditions. We were running at 16 knots but at one time we had to slow to 14.5 because of the deterioration in the sea conditions. The yacht was coping well with the head sea conditions and once again we experienced very little movement in the yacht. 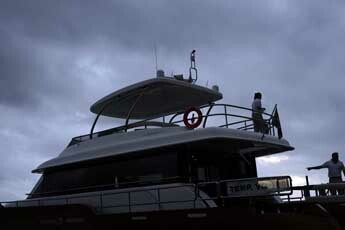 It was only after we left San Remo in the late afternoon that the conditions started to deteriorate. The wind was right on the nose, right on the bow and with the wind freshening we were heading into 2 metre waves. Still the yacht coped well and we were maintaining 15.5 knots in these adverse conditions a very creditable speed in conditions that might have challenged a planning hull. However the forecast for the winds was deteriorating with a fast developing low pressure and with a couple of problems showing up, the prudent t5hing was to go to Cannes and ride out the storm. We got into Cannes at 1015 and our decision to run for shelter proved to be the right one when it was blowing at 35 knots the next morning. 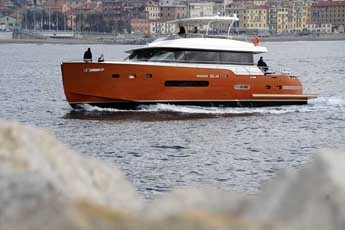 Magellano has passed its first test and every hour at sea is making me feel more comfortable with this yacht. I am now confident about its performance and 16 knots appears to be a reasonable speed for long range cruising. The yacht has certainly proved that it can handle rough conditions so when we set out in the morning on our run to Gambrills in Spain I am going to sea with a great deal of confidence even though the forecast is not as good as I would like. That storm we had appears to have moved to the Spanish coast so we may get some lively sea on the way but hopefully by then we will be under the shelter of the coast. It seems strange to start a new love affair at the age of 76 but I can feel that I am falling very much in love with Magellano. 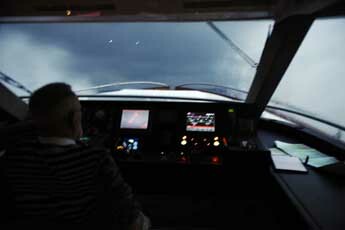 Fantasic experience, fantastic boat, fantastic Captain and Crew!!! 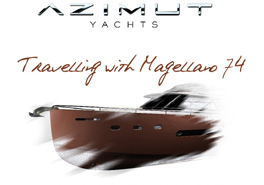 Very compliment to the Azimut yachts shipyard for this amazing project. Go Dag, this is a new challenge for you!! !